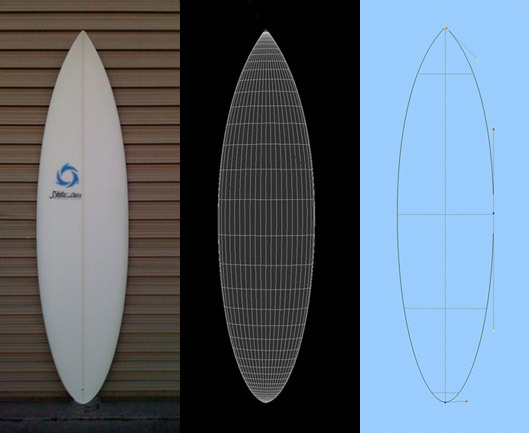 The "Kestrel" is a cross between a high performance shortboard and a classic hybrid. Following the historical theme of crossing a shortboard with a longboard to yield the classic hybrid, The "Kestrel" mixes the gene pool another step to bring short board performance to a maximum surface area - high volume design. This version of the variables offers great wave catching features and great paddling mobility in the line up with extra surface area and volume and pure shortboard performance with it's progressive rocker, profiles, outline, bottom contours, and rails. One of the most versatile designs to date currently enjoyed by groms from 4 to 70 years of age.